A raft of efficiency measures should ensure that the Mazda6 will be well received when it arrives in Ireland early next year. A raft of efficiency measures should ensure that the Mazda6 will be well received when it arrives in Ireland early next year. Striking good looks, teamed with a powerful yet efficient engine and dynamic appeal - regularly missing from this segment - mean it should be able to mix it up with the class leaders. 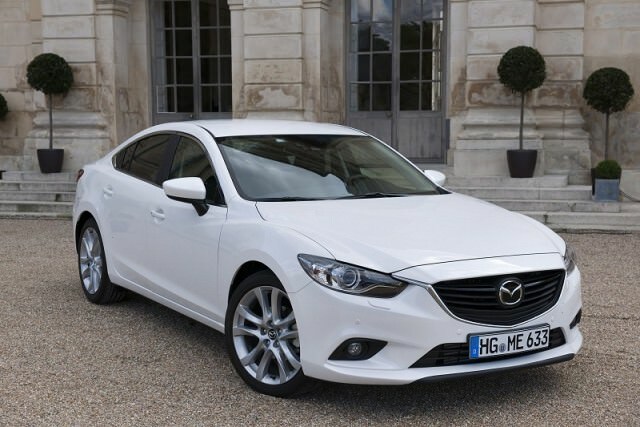 Whether it does or not all depends on whether Mazda Ireland can get the price right. Rarely does a mainstream car make it from concept to production with so few changes. The Mazda6 is clearly derived from the Takeri concept that was first shown at the Tokyo Motor Show in late 2011 and the 6 is now the second car (after the CX-5) to incorporate Mazda's new 'Kodo: Soul of Motion' design language. A lot was made of the car's animalistic styling, said (by chief designer Akira Tamatani) to have been inspired by a crouching tiger, with the result being a look that really sets it apart from the conservatively styled competition. By moving the A-pillar backwards Mazda has not only increased driver visibility but also given the 6 a cab-rear stance that is more in line with BMW's styling than that of mainstream competitors. The look, feel and space inside are a big step up from that of the current car, and Mazda says the rear legroom is best in class. Everything is logically laid out and the components you interact with the most have a quality feel to them, but the quality and design is still behind that offered by Volkswagen, BMW and Audi. At our briefing a lot was made of what the new SKYACTIV technologies (an umbrella term to describe Mazda's new chassis and powertrain) bring to this car, but the real test is on the road, where the 6 excels. The 2.2-litre diesel engine is the same twin-turbo unit previously tested in the CX-5 and it impresses with its smoothness and power. The 2.2-litre unit produces 150hp and 420Nm of torque, but unlike conventional diesels it loves to be revved with peak power not kicking in until 4,500rpm. Despite this, fuel economy and emissions are impressive with 4.1 litres/100km (68.9mpg) and 108g/km CO2. The suspension setup is an evolution of that fitted to the CX-5 (the first car to feature SKYACTIV) and has been tuned for added comfort. Even on optional 19-inch alloys the ride remained compliant over rough roads yet handling was akin to that normally associated with the Ford Mondeo - long the benchmark car in handling terms. There is a good level of feedback through the steering wheel other than at the straight-ahead where it is strangely numb. Mazda's engineers used the six-speed manual gearbox from the MX-5 as the target for the new SKYACTIV transmission and the result is a gearbox that is short in throw and a delight to use. The automatic option was even more of a revelation however with its smoothness between shifts making twin-clutch units seem jerky in comparison. It does have an effect on economy though with fuel consumption and emissions rising to 4.8 litres/100km (58.9mpg) and 127g/km respectively. Prices and final specifications for the Mazda6 have yet to be confirmed for Ireland but are expected to follow the trim lines of the CX-5 - Executive, Sport and Sport SE. Tentatively speaking the Executive may only be offered with the 2.0-litre petrol engine, while diesel, be it standard 150- or high-power 175hp, will be limited to Sport and Sport SE models. The entry level petrol version is expected to come in at €28,000 with the diesels estimated from €30,000. The Mazda6 is the first car to be fitted with new i-eloop technology. The capacitor based regenerative braking system allows the 6's electrical components to operate at times without draining engine power - therefore improving economy. Mazda moved to a capacitor system due to its ability to charge and discharge quicker than a lead-acid or lithium-ion battery. The vehicles driven were pre-production models with a few squeaks and knocks still to be ironed out. First cars are expected to arrive in Ireland in February. As more and more buyers move to crossovers the large saloon class is beginning to diminish, meaning manufacturers are fighting over a smaller market. To break the monopoly of the Insignia, Passat, Avensis and Mondeo new entrants have to bring something else to the party. With striking good looks, great driving dynamics, and what looks to be a generous specification the Mazda6 has a lot going for it. However, the real litmus test will be the price that the 150hp 2.2-litre diesel comes in at.